It appears that I’ve come to the end. I feel that I have a greater sense of awareness of what I can do to lower the level of stress as I feel it. And for the level of stress I don’t feel or aren’t aware of, my hope is that that will decrease over time as well, as I continue to do the things that I can do to consciously keep my stress under control. When I don’t feel so stressed out, I feel better overall, and this contributes positively to my general sense of happiness and well-being. It’s all logical. It’s not like this is hard to understand. But what is usually very hard for me is to slow down the all-too-familiar ride of stress and anxiety and wound-up-ness. I’m so used to how it feels that it’s uncomfortable to me to feel any way else. But the more and more I pay attention to the positive effects of staying relaxed and not being so tense and hurried and knotted, the more and more I want that (staying relaxed) instead of the other (being tense). As for my routine of writing, reading/praying, and revising, this has been working out much better for me. The mornings come so much faster now and seem to be more productive for me because I’m focused like a laser on what I need to do in the space of time I have to do it. I feel that I have achieved a much better balance instead of doing one thing for an undetermined amount of time until I feel that I’ve reached a satisfactory stopping point. This sort of approach works when time is on your side and interruptions can be non-existent (like, if you lived alone and didn’t have to do anything else except write and read). But when time is of the essence and interruptions are endless as much as they are inevitable, it gives a greater sense of goal reaching when there is a reasonable time frame set for each thing. 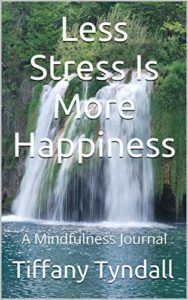 Less Stress Is More Happiness by Tiffany Tyndall is available for purchase here.